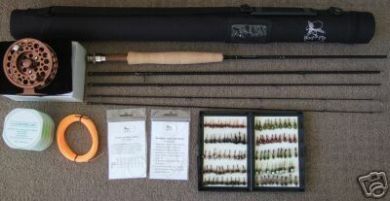 Rod & Fly Tasmania's tuition and Guiding service Introduces its Fly Rod range that delivers new levels of performance. Developed by us with other Guides in the UK,designed by professional fly fishing instructors and fly rod engineers with more than 14 years rod building experience, and 100's of collective years of fly fishing.Manufactured from the latest super-graphite integration of extra high module T-46 Carbon Graphite IM10 grade, which allows smaller diameter blanks with a superb progressive Fast action. The blend of high modulus graphite fibres creates a perfectly balanced lightweight blank that is more sensitive than anything available on the market today. Lightweight with a delightful crisp, fast action, these rods make distance casting easy, whilst maintaining tremendous 'fish ability' throughout a wide range of fly line densities. Utilising only the best components and materials has produced a rod range that will appeal to the most demanding .When you’re out dawn till dusk You'll need a rod that will punch a sinking line or saltwater fly far out into the wind and Later it must present a buzzer, emerger or dry fly with feel and delicacy. You're looking for lightness without frailty, power with sensitivity.The construction of high-modulus carbon fibre, the advanced performance taper, the ultra-slim blanks and the lightning tip recover combine to give you distance, accuracy, improved presentation and instant feel,ALL rod features a Black matt no glare, scare, matt finish, with no rod flash while casting, and less chance of spooking fish, An essential feature when in Tasmanian watersAll rods come with spare tip in a tough cordura covered case complete with rugged zip closure and handy carry strap. The Rod & fly Discovery range of reels are simply awesome . Nothing pretentious about them, just great value , quality and design on the four models, you will have a reel to tackle small wild browns in streams, to large fish in the biggest lakes or a saltwater monster.Quality, performance and total durability. Lightweight and functional. Differing spool sizes cater for any situation. Disc drag mechanism offering state-of-the-art sensitivity.The Rod & fly Discovery Range of fly reels fits the bill for today's requirements , lightweight design to match the new generation of fly rods. Beautifully machined from high grade aluminium bar stock, refined to offer the ultimate in strength while remaining super light. All models feature ultimate drag for smooth fish-fighting performance. A Rod and Fly Box fully stocked with trout flies that professional trout fly fishing guides use with their clients. A great gift for the fly fisher who has everything. A selection of essential trout flies that produce strikes consistantly, selected by Rod And Fly's professional guide who fish Tasmanias Lakes and rivers regularly. The next best thing to spending the day with our guide! We tie professional flies. The difference between professional and standard is that professional flies are tied to a more exacting standard. We only use the very best materials available. All our flies are hardwearing and robust, the professional range offers the serious fisherman an outstanding level of quality. Rod and Fly Tasmania is owned and run by Mike Tenner who is a full time accredited guide in Tasmania the #1 location for trout fishing in Australia. "LOOK HIM UP IN GOOGLE" All of the flies we sell are tried and tested patterns both for quality and standards, Mike is using the flies most days of the week in his guiding business.We have All positive feedback of 1947 received on our flies We promise that you will be 100% satisfied with the quality of our flies or we will refund your money.